This material weighs quite a bit, but it is very durable and keeps heat well. And he has the ability to easily bring out the excess moisture, passing it through its pores. We are talking about foam concrete, which is not well known to everyone. Because of this, it seems to many that it is not at all suitable for building houses. However, the characteristics of foam concrete blocks are such that they are fully capable of replacing bricks or cinder blocks. But you have to work with them a little differently. And how - read on. There are 4 types of foam concrete produced in a non-autoclave manner. 1. The materials of the grades D150 to D400 are called thermal insulation. Their density varies from 150 to 400 kilograms per cubic meter. Stamps below D400 are not rated for strength class. And for D400, this parameter is in the range from B0.5 to B0.75. This corresponds to a tensile strength of 9 kilograms per cm 3 . Frost resistance of the listed brands of foam concrete is not subject to rationing. D900 - from B2.5 to B5 (strength of 35 kilograms per square centimeter) . Frost resistance coefficient F in ascending order of the mark: 15-35, 15-50, 15-75, 15-75. D1200 - from B10 to B12,5 (strength of 90 kilograms per square centimeter). 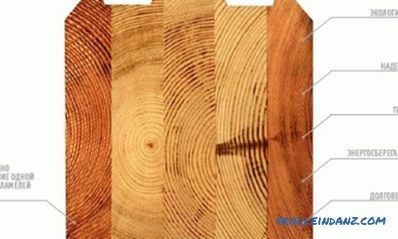 Frost resistance coefficient F is the same for any of the grades: its value is 15-50. 4. The materials of the grades D1300 to D1600 are called structurally porous. Their density varies from 1300 to 1600 kilograms per cubic meter. They are produced in small batches, so the characteristics of foam blocks of these brands are not designated in GOST. 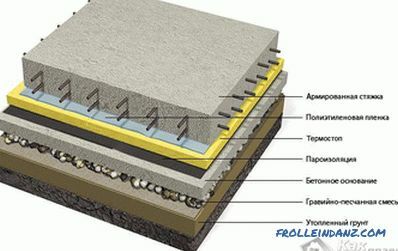 The specific strength indicator depends on the temperature and humidity at which the foam concrete was produced, as well as its filler and brand of cement used. Dividing the number of brands of foam concrete by 20, you can get an approximate indicator of strength (albeit, slightly underestimated). Take, for example, foam D1600. We get (with a decent margin) tensile strength of 90 kilograms per cm 2 . However, the stock in this case will only benefit. Consider the thermal conductivity of various grades of dry foam concrete, filled with sand. The unit is watts per meter per degree Celsius. And also comparable under the same conditions and vapor permeability coefficients of these brands of foam concrete. The unit of measure is kilogram per meter-hour-pascal. As for dimensions, the D600 and D800 brands have sizes of 20 by 30 to 60 centimeters. D600 produced also in the amount of 10 to 30 to 60 centimeters. Both on TV, in the press, and on the Internet, there is a debate as to which foam concrete is better - autoclaved or non-autoclaved. Manufacturers of both types of material angrily expose each other’s products, while consumers can only speculate on which of the materials are better suited for construction. But in fact, both gas silicate and foam concrete blocks are very close in properties, and both materials have disadvantages. Next, we consider in detail the characteristics of foam concrete, trying to give this material an objective assessment. At the same time, we will compare it with gas silicate in all respects. The ability to retain heat is high. Compared to brick, this material has a thermal conductivity of less than three times. In fact, gas silicate blocks are not lagging behind in this. Their thermal conductivity is at the same level as foam blocks. Weight - small. Compared with expanded clay, it is less than two and a half times. Gas silicate weighs about the same. Therefore, both autoclaved and non-autoclaved aerated concrete blocks are easier to ship, transport and assemble than traditional building materials. And of these, you can build houses without equipping them with a heavy foundation, which will affect the speed and ease of installation. Naturally, we are talking about low-rise buildings - high-rise buildings should have a solid foundation. Strength is sufficient. It is quite possible to lay the load-bearing walls of three-story (not higher) houses from the foam concrete blocks of brands from D900 and above. If you also mount a reinforced concrete supporting frame, you can build a building of any number of floors. As for gas silicate blocks, they are even stronger. Frost resistance is excellent. Due to its porous structure, both foam concrete and gas silicate have enough space inside for water, which expands when it freezes. Therefore, when the wall freezes, its damage will not occur both outside and inside. Fire resistance is good. This also applies to foam concrete blocks and gas silicate. Four hours, not less, they are capable of being exposed to open fire and very high temperatures. 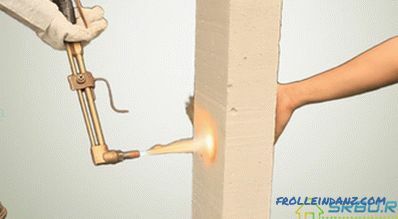 Check it out easily: aim the gas burner at a wall made of foam concrete, and then watch for several hours. The result will please - in contrast to ordinary concrete, there will be no splitting of the surface, no explosions. Environmental friendliness and biostability - at a height. This material is not subject to rotting and does not deteriorate with time. He does not emit harmful substances hazardous to health. By the way, if we compare it with gas silicate, the latter is less safe in this regard. Indeed, in the autoclave, when foaming, the smallest pieces of aluminum and lime enter into a chemical reaction, as a result of which hydrogen is obtained. It will be allocated (in small quantities) and later, during the installation of the units, and in the operation of the house. But for the production of foam used foaming agents (synthetic or protein), which do not contain hazardous gases. Yes, and the pores of this material are sealed - they are the same in structure as the foam. Suitability for monolithic construction is sheer. 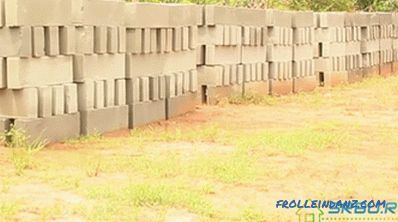 Foam concrete blocks can be manufactured right on the spot - just install the unit. 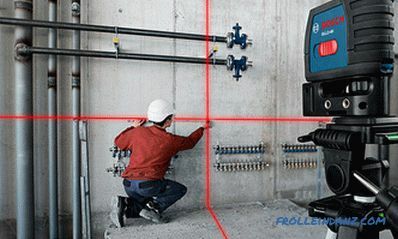 Compressor to create the necessary pressure and through a special hose to bring the resulting material to where it is necessary during the construction process.Monolithic construction has its own specifics, and for it foam concrete can be only a heater or additional material. So, for example, you can either make a brick wall half a brick thick inside or outside. Then (not end-to-end) put a moisture resistant plasterboard partition. In the resulting gap pour foam concrete for insulation. It will take a little time, and will be cheaper than installing a traditional heat insulator. The ease of processing is quite impressive. Foam concrete is very easy to cut, drill and chisel. No special tools are required, and there is practically no physical effort required. Moreover, due to the lightness of the material, blocks can be easily transferred to the processing site and back. The price is quite low. Compared to other building materials, foam concrete blocks benefit greatly in value. As a rule, conduct a comparison, recalculating the amount of material on the brick. If we take into account the fact that the foundation is needed inexpensive (lightweight), then the construction will be very economical. In some cases, this factor is decisive. Moisture resistance is not bad. Hermetic closed cells contribute to this. But gas silicate blocks that have channels inside, passing from one edge of the material to the other, are afraid of water. After all, she soaks them quickly enough, passing through these channels. The closed cell structure does not allow water to infiltrate the entire thickness of the block, and if it is placed on the water surface, it will float. Shrinkage due to increased moisture content is a significant minus. 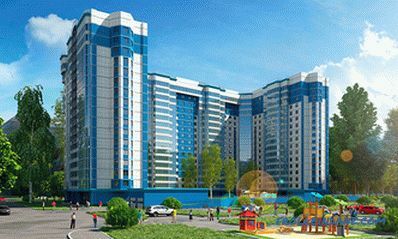 Moreover, it can be from one to three millimeters per meter of wall being erected. This happens if in the process of water production add more than necessary, or do not wait until 28 days pass. That is how much time is needed for the blocks to harden well. At the same time on them in any case should not get water. Unfortunately, some dishonest technology vendors do not comply. But the gas silicate is deprived of this disadvantage - it is not subject to shrinkage. Therefore, such precautions when working with him do not apply. The material’s ability to absorb moisture. It is not very large (much smaller than that of gas-silicate blocks), but it makes use of additional finishing. In particular, you can apply the technology of the ventilated facade, plaster the walls or cover them with a special water repellent for concrete. This tool is available in the form of an emulsion. Foam concrete can easily peel off, especially on edges. It is necessary to load this material carefully, without in any case piling it on the body. In principle, the lightness of the material allows you to gently transfer it without damaging it at all. The walls of foam concrete will not hold any nails or ordinary dowels - they just fall out. It is necessary to apply a special dowel for foam concrete with a nozzle made of ABC plastic. There is a thread on this nozzle. First, you need to twist the metric screw into this nozzle. A screw designed for wood is also suitable. 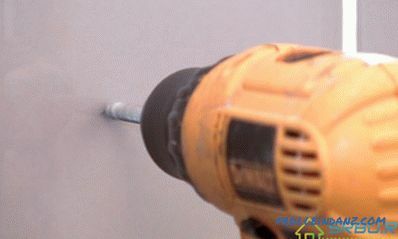 Drill a hole in the wall and thoroughly clean it, you need to very carefully screw in the nozzle with a screw inside. This design holds quite reliably. Manufacturers who do not comply with the technology and the ratio of the necessary components, do not give foam concrete to mature, contribute to the appearance of negative reviews about this material. They are driven by the thirst for quick money. But reliable foam concrete manufacturers, which monitor the quality of their products, produce material that satisfies the most demanding developer. Laboratory tests confirm this - the technical characteristics of the foam block made by such a company fully comply with all standards. 1. First of all, look who exactly makes the given foam blocks. Ask for a certificate, check the delivery terms and product compliance with the state standards. If a manufacturer openly provides maximum information, then he has nothing to hide, and his material is of good quality. By the way, this is done by large firms, reliable and well-proven. A good foam block manufacturer usually has a production area of ​​at least 180 square meters, on which there is a unit for cutting blocks. Moreover, the production area should be heated and have a roof. 2. Price also matters. On average, for the brand D800, it is about $ 80 per cubic meter. If the material is much cheaper, it is worth thinking about it - this may affect the quality. And again: if the manufacturer convincingly declares that his foam concrete of the D600 brand is structural, as it is made according to the "secret" technology - do not believe it.No special recipes, no subtleties of technology can turn one brand into another. You cannot even lay out a small one-story house with such blocks - this brand of material for load-bearing walls cannot be used. 3. Carefully inspect the blocks - they should not be pure and bright white. This will not allow technology. Normally, foam concrete should be grayish, slightly lighter or darker, and non-uniform surface color is not allowed. 4. Check how tightly the foam cells are. If they are interconnected, moisture will easily penetrate the material. Split one block and see if its structure is the same from the outside and inside. Cells should be round, the presence of chips or cracks is unacceptable. 5. 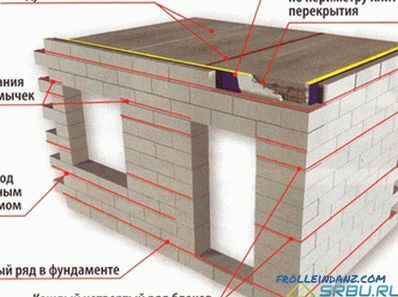 To lay the walls without problems, the blocks must be strictly rectangular - check this. Putting two foam blocks one on another, try to shake them, see if there are any gaps. And explore all four sides of the blocks - this is important, since the flaw can be only on one side. And in the future it may take you a lot of time, and spoil your nerves. 6. 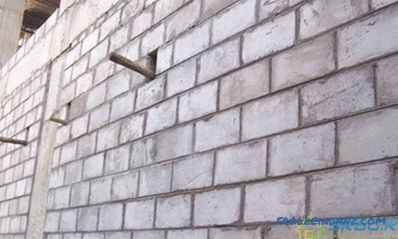 Having bought fresh material, you should not use it immediately for walling. After all, the necessary strength and other technical characteristics of foam-concrete blocks will acquire only 28 days after manufacture. Therefore, the most correct solution would be to sustain the foam concrete purchased for two or three weeks. At the same time, it must either be well covered from moisture or be indoors. This will help you avoid trouble if you are still sold undeclared material. An example of improperly organized storage of foam blocks, they are not covered from above, and it is already clear that from the damp earth they sank of moisture. This infographic shows the features and nuances of laying foam blocks. Tip 1. Since the blocks of foam concrete on the edges are fairly easy to damage, try to unload them carefully. Putting them is better not on a standard mortar (although it is possible for them), but on a special glue having a cement base. Its layer (only 2 or 3 millimeters) will turn out much thinner than a layer of ordinary cement mortar, and cold bridges will not appear. But the thick seams between the blocks will inevitably release some heat to the outside. Tip 2. Walls made of foam concrete need to be tiled. Do not believe manufacturers claiming the opposite - they shamelessly lie. Rain, snow, winds and hurricanes will gradually destroy the foam concrete, if it does not protect. Facing material may well be plaster (both ordinary and mineral), as well as the material used for ventilated type facades. As for the plaster, then under it you will need to lay a grid, fixing it on the wall of foam concrete. Tip 3. When facing brick blocks with brick, be sure to leave an air gap, because these materials have different air permeability. With their tight fit, water evaporation will not be able to break through the brick cladding. They will be reflected from it, pass back through the foam concrete and return to the house. Do not allow this to happen.